He most likely stole that card. Lol. As if he doesn’t have enough money. By the way you can even read his name on it. 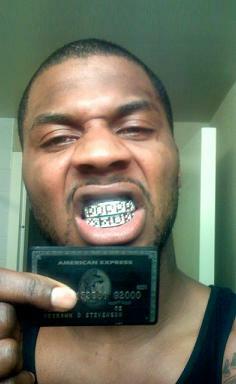 American Express must be very proud. He probably does not even know how to spell his name. That takes care of that, i dont want one now !!!! What an insipration to want to have nothing !!! He look damm ugly. Better jump to the sea. LOL YOU HAVE TO BE THE DUMBEST F*** EVER….IT SAYS HIS NAME ON THE CARD… GET A CLUE!!! You can buy fake ones with your name on it for $95 on ebay. dont you love how these guys flaunt what they got because they grew up poor, and now their better than all of us because they can throw a ball into a hoop better? the funny thing is watching them get injured, losing their contracts and going broke because they are ignorant about investing. I didn’t know we were paying reparations with the BLACK CARD. Im willing to bet he is in debt and soon to be broke. Just like Allen Iverson.